As AAHS celebrates its 50th Anniversary, it looks to you to help continue the legacy of the Hand Association and the Hand Surgery Endowment. 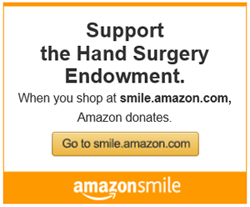 As a 501c(3) entity, all monetary contributions made to the Hand Surgery Endowment are tax deductible to the fullest extent of US law. The HSE's Federal Tax ID number is 37-1355162. Contributors will receive a formal acknowledgement notice from the HSE administrative office which includes information about tax deductible donations.